REUTERS/Yuri GripasInternational Monetary Fund (IMF) Managing Director Christine Lagarde gestures as she arrives at a G-24 meeting during 2013 Spring Meeting of the International Monetary Fund and World Bank in Washington, April 18, 2013. 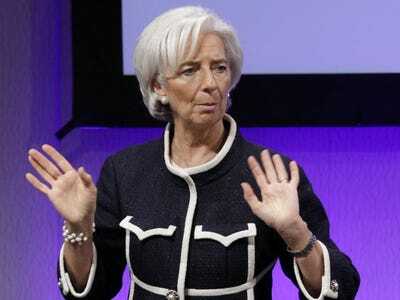 Brisbane (Australia) (AFP) – International Monetary Fund chief Christine Lagarde has backed the G20’s pledge to raise economic output by 2.0 per cent in the next five years, but warned it will not create all the jobs needed. Speaking to the Australian Financial Review from Washington before heading to Brisbane for this weekend’s meeting of the world’s 20 biggest economies, Lagarde said focusing on growth was the right strategy. Host Australia has pushed for members to commit to reforms, including cutting red tape and encouraging private infrastructure investment, in a bid to boost the group’s economic output by US$2 trillion. “Moving the needle up two points over five years is certainly an improvement,” the former French finance minister said in comments published Thursday. In a report ahead of the summit, the IMF said the world economy faced stiff headwinds from sluggish growth in Europe and Japan and a slowdown in emerging economies. It trimmed its growth forecast for the year to 3.3 per cent, from 3.4 per cent, citing geopolitical tensions and volatility in financial markets, and urged advanced economies to tackle high unemployment by spending more to generate jobs. “The recovery is under way but is uneven, fragile and with downside risks on the horizon,” Lagarde told the financial daily newspaper. On the upside, the Washington-based body said a nearly 20 per cent fall in oil prices since September would, if sustained, aid growth. Lagarde said she had a “strong confidence” a deal on the 2.0 per cent goal would be reached this weekend and praised the government of Australian Prime Minister Tony Abbott for focusing the G20 agenda. “I think the Australians have done something to be satisfied and proud of because there are deliverables and they are passing the baton to Turkey with a bunch of good things done,” she said. US President Barack Obama, China counterpart Xi Jinping and India’s Prime Minister Narendra Modi are among the leaders to be hosted by Abbott in Brisbane for the two-day summit.